Chip Ganassi Racing and Ford Performance struggled in their first outing with the GTLM Ford GT this weekend, however Multimatic was able to make Ford’s time in Florida a little more bearable. 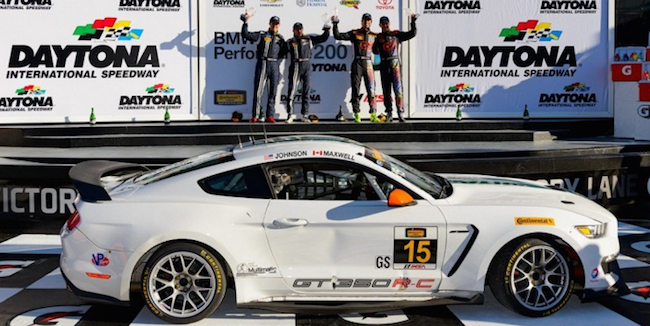 Multimatic driver Billy Johnson won the IMSA Continental Tire SportsCar Challenge race at Daytona Friday in the Ford Shelby Mustang GT350R-C, continuing a string of successes for the racecar that began last season. Johnson, who shares his No. 15 Multimatic Motorsports Shelby with Canadian Scott Maxwell, pulled away from Pierre Kleinubing in his No. 76 Compass360 Racing Shelby following a late-race restart with 20-minutes to go to win the race. Kleinubing would go on to hold second place thorugh to the checkered flag, giving the Shelby GT350R-C a 1-2 in the first CTSCC race of the year. Third in CTSCC was Marc Miller in the all-new Cayman GT4 Clubsport of CJ Wilson Racing. In behind the Porsche was the No. 99 Automatic Racing Invisible Glass Aston Martin Vantage, which was followed by the always strong No. 13 Rum Bum Racing Porsche 997. The CTSCC heads to Sebring in mid-March for the next race of the season. It will be the Shelby GT350R-C’s first official outing to Sebring as the car debuted about halfway through the 2015 CTSCC season.